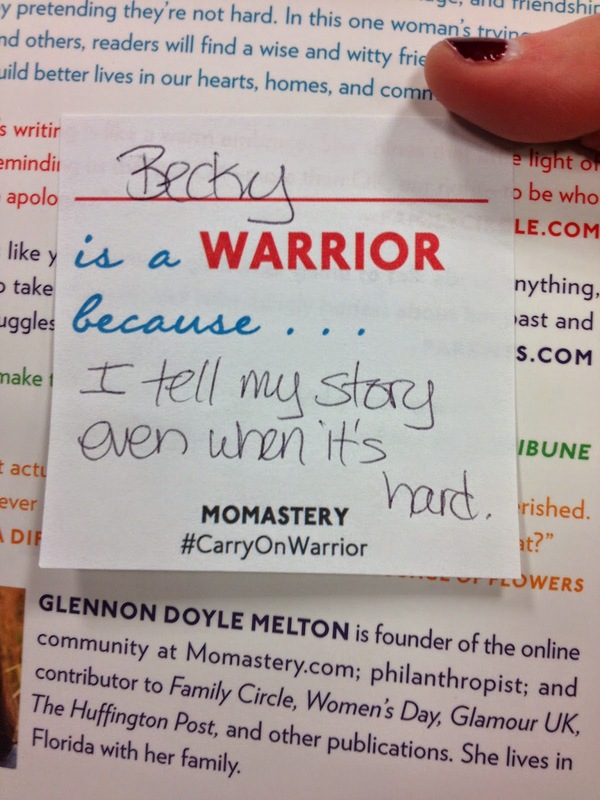 I don't care if it's a cliche - Carry On, Warrior changed my life. I am raw. I am out there. I am vulnerable in my writing and my blogging. When I read this book I met a kindred spirit in Glennon. Our stories are different, but we share them because it matters to us, and to others. We let people know they are not alone. When I found out Glennon was going on a book tour for the paperback release of Carry On, Warrior, I got excited. 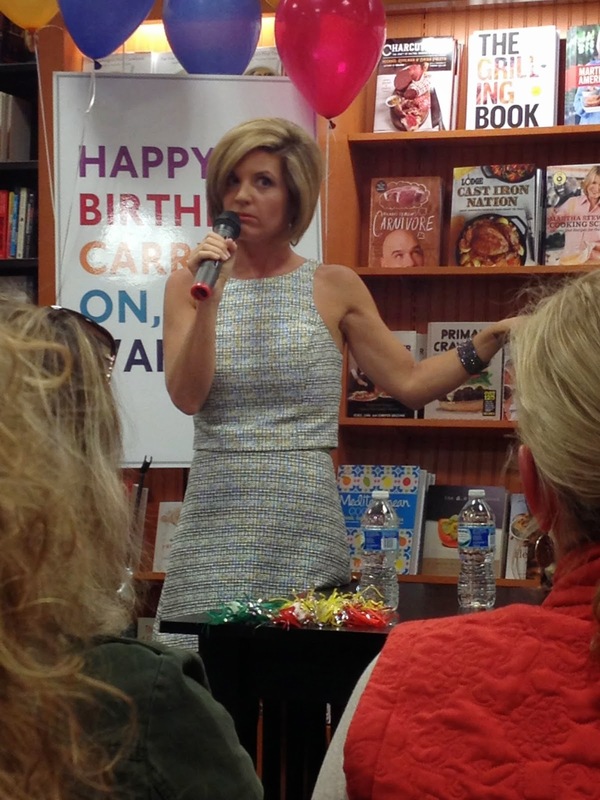 When I saw she was coming to a bookstore 20 minutes away from me and I screamed. Loudly. More than once. I said to Ben, "I might scream, AND cry, AND throw up when I meet her!" (His response? "Well babe, you'd be...memorable). I'm happy to report I did none of those things. But I did get to meet her and it was incredible. She talked for a bit before signing books and I loved how funny and sweet and real she was. While standing in line for books to be signed they had us fill out these post-its. This is while we were chatting about the glory that is left-handed people. Because HELLO, I am left-handed and so is Glennon which only makes me love her MORE! I went by myself, but never felt alone. I chatted with people in line, and was amazed at the sense of community I felt with these strangers in a bookstore. I bought two copies of the paperback - one for me, and one for you. YES. I am THAT awesome. 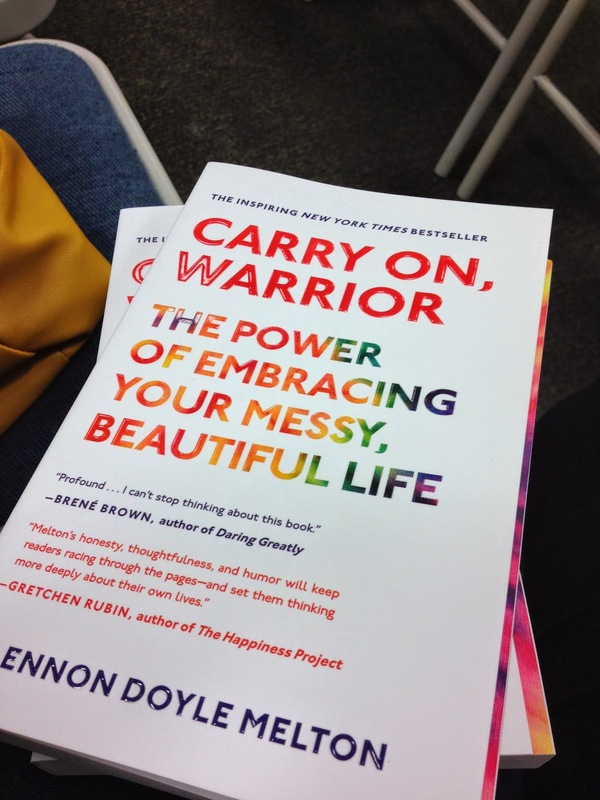 I am giving away an AUTOGRAPHED copy of Carry On, Warrior. To enter this giveaway leave a comment telling me why you a warrior - nothing is too big or small! One extra entry if you follow me on Facebook, and one extra entry if you follow me on Twitter - but be sure to let me know! The winner will be chosen this Thursday, April 17th, at 10 PM (EST) and announced Friday morning. This means you have until 9:59 PM (EST) Thursday night to enter! Carry on warriors! Happy Monday! I was not compensated for this giveaway - I bought this book with my own money and stood in line for an hour to get it signed. I am giving it away because I think everyone should have a little piece of Glennon in their lives. I'm a warrior because I force myself to keep on keeping on (regardless of the size of the situation, even tiny moments can be scary like big moments) Just breathe and keep on moving. I am a warrior because I ask the tough questions, even when it's not the popular thing to do. I'm now following you on FB! Did my comment not work? Grrr. And if it does come through sorry for the double comment.. I have never read that book before but I've heard amazing things about it so I would like to read it! I am a warrior because when faced with difficult situations I always work hard to find a solution! I also think I'm a warrior for being positive and always trying to see the silver lining. I am a warrior because despite my chronic disease, I wake up every single morning and give the day my best shot to live creatively and become a better person. Thanks for allowing us the opportunity to win such a great book! I sent a request to follow you on Twitter (I am starstuffnet). BEST OF LUCK to everyone entering this giveaway. aw yay i'm so glad you had such a great time. this sounds like an awesome evening. as for me, i'm a warrior because i keep going even when i want to stop. I'm a warrior because I'm determined to laugh through my tears and make magic happen in my life, and in the lives of the people I love. I am so glad you told me to buy this book when I visited you last July. It was an amazing read. Since I own it, don't include me in the giveaway as I want others to have the opportunity to read this! I am a warrior because even though this past year was like a series of sucker punches, I get up every day and keep putting one foot in front of the other. I am a warrior because I am a single mom. I am also a nurse. I always put others before myself. I follow you on fb and Twitter too. And I think you are amazing!! I am a warrior because I'm passionate about helping others become warriors...often through telling my own brutiful story. I am a warrior because I'm an infertility survivor, NICU survivor, and totally in love with being a twin mama. I'm also a warrior for bettering our public education system so that all children have the chance to be successful. I am a warrior because, despite losing my best friend of 22 years very unexpectedly two months ago today to a pulmonary embolism, I am still getting up every day trying to not take one second for granted. I am also trying to be the best role model I can be for her 2.5 year old son, who is also my godson. I also follow you on Facebook and Twitter. Is it sad that I have tried to enter this giveaway a handful of times, but find myself in tears each time?! I never thought of myself as a warrior until you told me about this book, why you are a warrior, why all women are warriors...here goes nothin'! I am a warrior because I just keep going, even when I want to quit. Being diagnosed with PCOS, Fibromyalgia, and some other issues recently has really left me in disbelief. Add that to Meara's NF diagnosis (and all the craziness along with it) - everything is so overwhelming and honestly, most days I just feel like a failure. Pre-Mommy days would have left me in bed for days when something goes wrong/comes up. Post-Mommy refuses to do that. I am now a role model for the most awesome little girl and I am going to show her that SHE is a warrior too. I am a warrior because I will fight for NF to not define her or to define us as a family. I am a warrior because I will fight to be a better, healthier me in order to be a better Mommy for her. I am probably too late (in fact, I know I'm too late, it's 10:30 your time!) but, I am a warrior because I go for what I want. Even when it is scary! Of course I follow you on FB and Twitter! Love you, friend!! MIss ya!